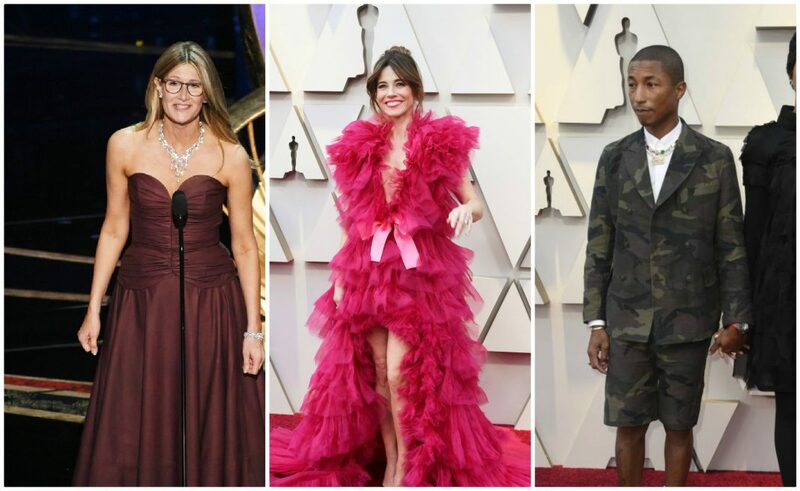 The Oscars' Worst Dressed—or Most "Meh"
Instead of pronouncing who we think was the worst dressed at the Oscars, we’ve decided to be nice. Or nicer, anyway. 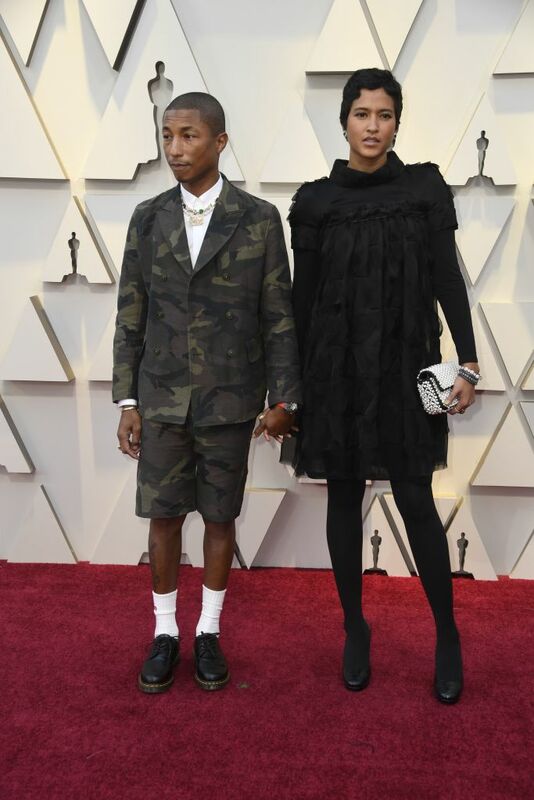 In 2019, everyone has a stylist—hell, dogs have stylists now—so it’s almost impossible, or at least very, very difficult, for anyone attending the Oscars to look truly ghastly. However, there’s always a few who manage to blow it—or are trying too hard or just aren’t as chic and subtle as some of their tasteful counterparts. Here’s our (whew, short) list of Oscar attendees who managed to be “meh:” definition above. Uninspiring: we’re trying to be nice. 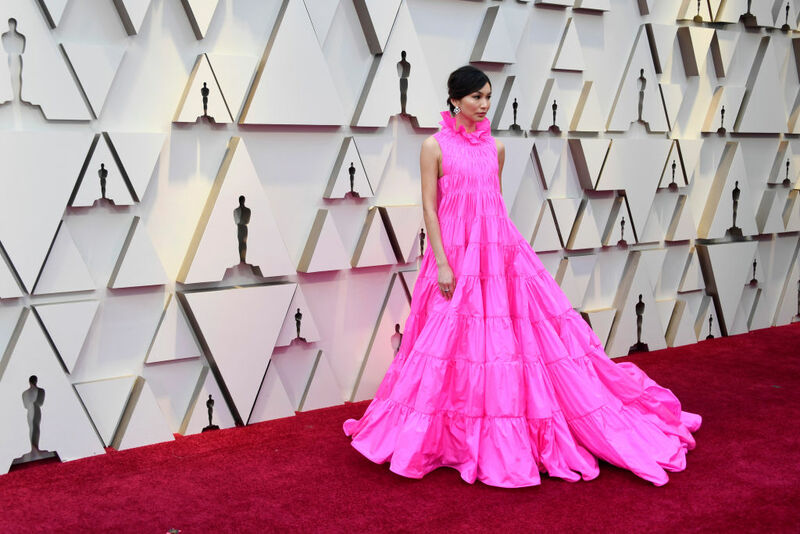 You might as well call it “Little Fuchsia Bo Peep.” Green Book star Linda Cardellini went with the big ruffly trend, but took it a bit too far. Ruffles from head to toe: particularly in fuchsia, particularly with a mini front and long train back, is taking it a tad too far. USA Today calls it “a pink nightmare. Looking alternately like a feather duster and Elmo in a nightie.” Cardellini must have known what she was doing. This looks like it was Lady Gaga’s leftover Grammy dress – Gaga, who’s now too subtle to touch such an effusive ebullient look. “Meh” is putting it mildly. Elsa Schiaparelli was so enamored of shocking pink she named her biography for it. Now it’s called “Schiaparelli Pink” . – but this dress was just a teeny bit too shocking. Brown’s so out it’s in right now—and that’s not a bad thing. But mud brown at the Oscars? A muddy choice. Doesn’t resonate under hard lights. 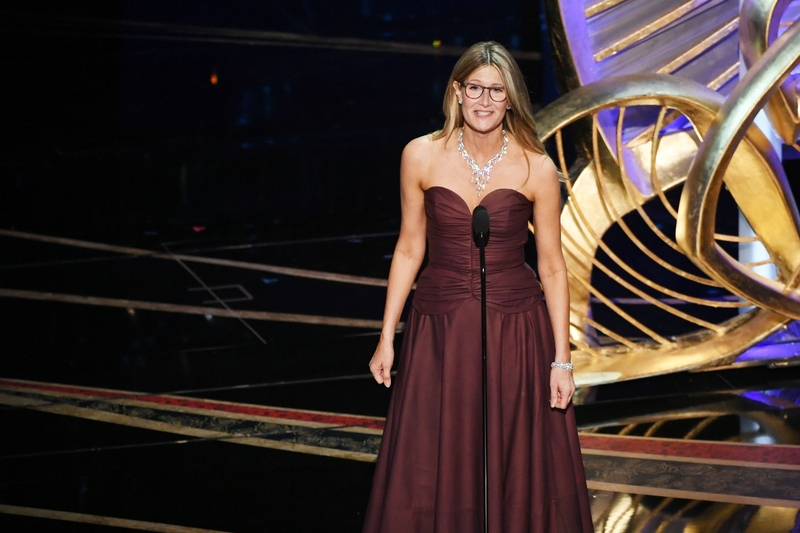 Plus, Laura Dern in nerd glasses with her brown ruched Rodarte: “meh.” Didn’t do a thing for her. Neither did that giant diamond pendant. That was pairing a glittery chandelier with an old, brown, worn-out sofa. One of the world’s most beautiful women, Crazy Rich Asians star Gemma Chan, is a British fashionista par excellence. But her beyond-voluminous Valentino coral/hot pink mock turtle-necked ruched tent dress in tiers—well, meh. It should have been on a much larger woman, or a woman that wants to hide: not one of the world’s greatest slender beauties. You’re cool. You’re seriously cool. We get it. You don’t need to try so hard. A double-breasted fatigue jacket paired with shorts—at the Oscars. Really perfectly appropriate for the MTV Awards. Stop messing up your awards shows. Meh! 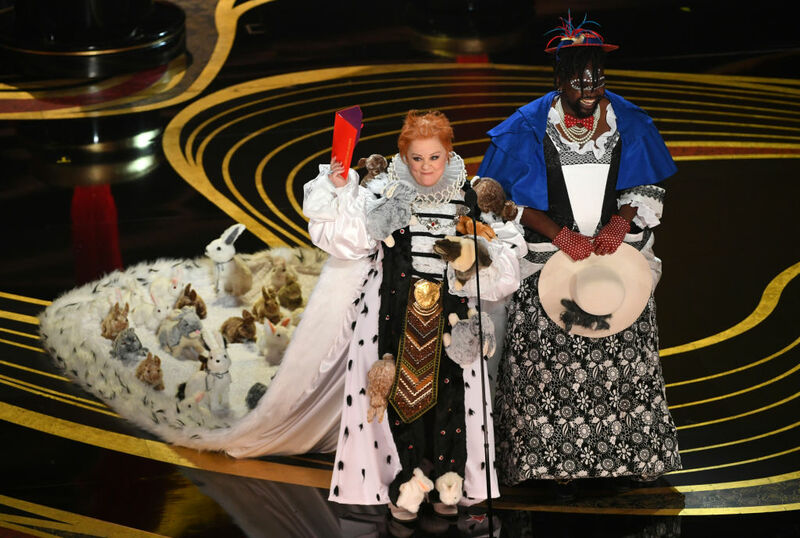 The duo presenting Best Costumes (to Black Panther) looked hilarious, got big laughs, and took up a whole lotta room. Our meh pronouncement: never leave home dressed like this.